iCandy have announced some fantastic changes to the nippy Raspberry for 2018. For the first time, a carrycot has been included with the pushchair. The carrycot will be a lovely snug area for a newborn to snooze whilst you stroll, and it is also suitable for overnight sleeping. The seat has been made deeper with quilted details to add more comfort and luxury to the seat. The seat harness has been enlarged too. There is a handy storage pocket on the rear of the seat to keep phones, money etc. to hand. 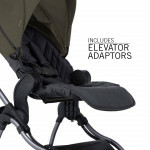 The new elevators will allow your child to be nearer to you to facilitate early communication. 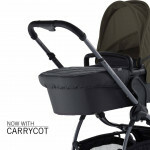 A soft touch leatherette bumper bar and carrycot handle has been added to the seat. The Raspberry has new denser fabric with a honeycomb weave which gives a two tone effect. This is similar to the Orange fabrics. The Raspberry canopy will extend and has an integrated sun visor and a mesh ventilation panel. The hood has an SPF50 rating. The suspension has been improved to ensure that there is a smooth, silent ride. There is a new Duo-Pod all in one seat liner and footmuff which will fit onto the Raspberry. One side is fleece to keep your little one snug and warm in winter, and the other side is smooth to keep them cool in summer. The new 2018 iCandy Raspberry has two new chassis’ finishes – Moonrock and Chrome. The new 2018 fabric colours are named after London areas and streets, and are Bloomsbury Black, Saville Row Sand, Kings Road Khaki, Piccadilly Pink and Greenwich Grey.